A feature in FME is an individual item within the translation. It is the fundamental (that is, smallest) unit of FME data. Typically a GIS or cartographic feature consists of a geometric representation plus a set of related attributes. FME is capable of restructuring either of these components. Sometimes content transformation operates on single features, sometimes on multiple features at once. 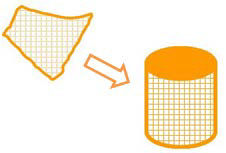 Features in FME have a flexible, generic representation that is unrelated to the format from which they originated. That means any transformer can operate on any FME feature, regardless of its source format. You can think of Content Transformation as altering or editing data. The wardrobe analogy still works here. You might take your clothes from the wardrobe to clean them, or alter them, or repair them, or dye them a new color, or all sorts of other tasks, before returning them to their place. Generalization – a cartographic process that restructures data so it&apos;s easily visualized at a given map scale. Topology Computation – conversion of a set of linear features into a node/line structure. Line Intersection is another example of geometric transformation. 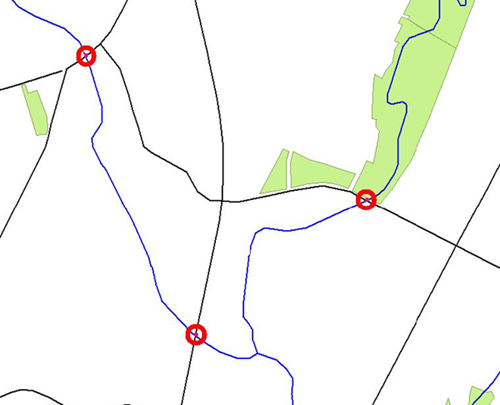 Here roads have been intersected with rivers to produce points that mark the location of bridges. Attribute concatenation as an example of attribute transformation. Each line of the address is concatenated to return a single line address. Did you miss me? You did? Well I&apos;ll cure that with some new questions for you!